As per the BEST’s proposal, high-end residential consumers, using more than 501 units, may see a 36 percent drop in power tariff. For now, except for consumers in the Below Poverty Line category, the BEST has proposed a reduction for all residential consumers. Residents of Mumbai’s island city are likely to get some relief in electricity tariffs with the Brihanmumbai Electric Supply and Transport (BEST) undertaking having proposed a reduction in its rates in a range of 14 to 36 percent. The BEST undertaking submitted its tariff proposal to the Maharashtra Electricity Regulatory Commission (MERC), which will take a final call, and has proposed lower rates mainly by doing away with the ‘Transport Deficit Recovery Loss’ (TDLR) for now. The BEST, which supplies power to residents from Colaba to Mahim and Sion, has been charging an additional surcharge to its power consumers to compensate for its losses in its transport division since 2012. The surcharge has been contentious with several activists and consumers having strongly opposed it. However, electricity bills for BEST’s power consumers may rise in future, with the company having clarified that it reserves the right to levy TDLR in future as per court orders. “The matter is pending before the Supreme Court, which has directed that such determination of tariff shall not be implemented until its further orders. However, the civil appeal is pending in the Supreme Court, and with this case attaining finality in future, BEST reserves the right to revise its claim for transport deficit as per the orders of the Supreme Court,” the BEST has said. For now, except for consumers in the Below Poverty Line category, the BEST has proposed a reduction for all residential consumers, giving maximum relief to its high-end residential consumers. For consumers in the Below Poverty Line category, BEST has proposed a mild 6.6 percent rise in rates to Rs 1.29 per unit, considering energy charges and TDLR, from the current Rs 1.21 per unit. 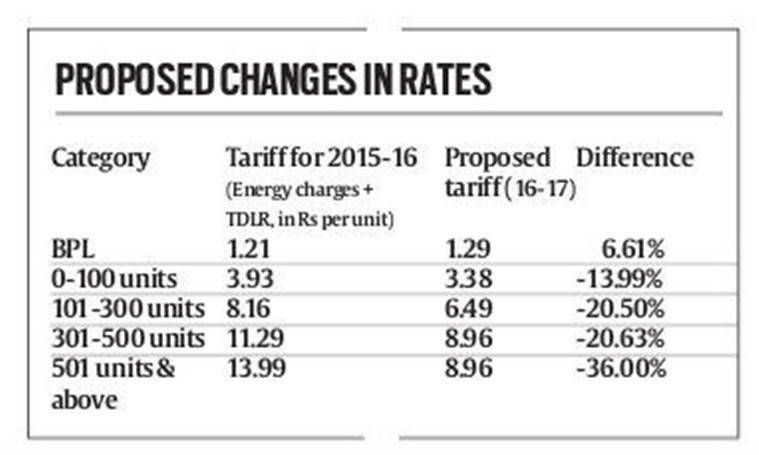 As per the BEST’s proposal, high-end residential consumers, using more than 501 units, may see a 36 percent drop in power tariff to a rate of Rs 8.96 per unit from the existing Rs 13.99 per unit. Similarly, consumers falling in the 301-500 units bracket and the 101-300 units bracket will also see a sharp drop of over 20 percent in rates. Those in the 301-500 units category are proposed to be charged Rs 8.96 per unit as against the prevailing Rs 13.99 per unit, while those in the 101-300 units bracket are proposed to be billed Rs 6.49 per unit as against the current Rs 8.16. Low-end residential consumers too might see their power tariffs dip 14 percent, with the BEST having proposed a rate of Rs 3.38 per unit, as compared with the existing Rs 3.93 per unit. “BEST has also proposed to increase fixed charges as these have not been increased since the tariff order of 2011-12 and total collection from fixed charges is very low as compared to the fixed expenses. It is therefore proposed to marginally increase the fixed rates,” the company said in its petition. BEST has proposed a 25 to 33 percent increase in fixed charges for residential consumers, while keeping fixed charges constant for residential users from the Below Poverty Line category.